Adamstown AC hosted the Mr Oil Wexford Juvenile (even ages) and Novice Cross County Championships last Sunday in scenic Ballyeden, Davidstown with Bree Hill as a backdrop. Solid banks of cloud and an unrelenting cross-course breeze kept temperatures on the cooler side but other than that it was a fine day for running. The going was very firm with the ground still to regain much of the pliancy given up to the long hot Summer. The action commenced with the younger age categories. Lea Bolger (Bree) won the Girls U10 race from Áine Crean (Adamstown) in 2nd, Saoirse Flanagan (DMP) in 3rd and Kayleigh Butler in 4th. Jayden Kenny (Bree) won the Boys U10 race from Tomás Brennan (Enniscorthy) in 2nd, Enda Byrne (SBR) 3rd and Aidan Bowe (SBR) 4th. Sarah Phylan (Enniscorthy) took the U12 title ahead of Éabha Keane (DMP) in 2nd, Rayna Thompson (Kilmore) 3rd and Emma McCarthy (St Killian’s) 4th. DMP took team Gold (12 points) with Éabha backed up by Aoife Walsh in 5th place and Sarah O’Mahony in 6th. Indeed the club packed really well as they had another two girls, both scoring on the ‘B’ team) in the top 12, namely, Nicole Lagan (10th) and Emma Barrett (12th). 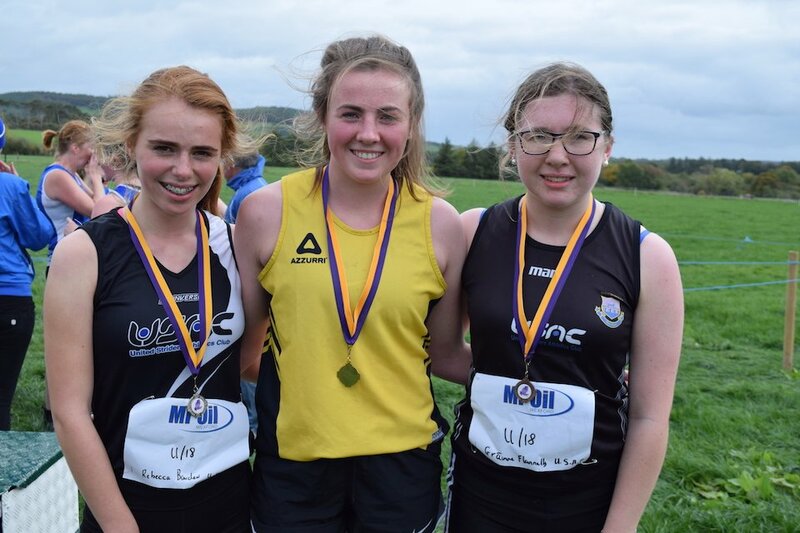 Rayna Thompson led Kilmore AC to Silver team medals (22 points) with Katie Foley in 8th and Ava Barry 11th. DMP ‘B’ took the Bronze (39 points) just ahead of SBR in 4th place. DMP’s Kevin O’Mahony gave a real virtuoso performance in winning the Boys U12 race. The 10 year old, who does not turn 11 until December, is a joy to watch such is his powerful, yet relaxed, running style. The fact that he is as happy running cross country in Winter as he is competing in sprints and long jump in Summer shows that he is blessed with great versatility to go with a winning can-do attitude. Eoin Hannon of United Striders was 2nd, Ross English (Adamstown) 3rd and Ronan Shannon (US) 4th. Striders, with four in the top 10, only needed three to take team Gold (12 points) with Hannon and Shannon backed up by Keelan Ryan in 8th. DMP took the Silver (24 points), Adamstown the Bronze (27 points) and Enniscorthy were 4th just one point behind. Kilmore AC made it a 1-2-3 in U14 Girls 3000m with Freya and Arwyn Thompson taking, respectively, Gold and Silver and Kate O’Flaherty in 3rd. This fine collaborative and cooperative effort, something we are more used to seeing among the Kenyans on the Grand Prix circuit, meant that the girls also took home Gold team medals. Ellie O’Mahoney, stealing in to nab 4th spot with her final lunge, helped ensure DMP took the runner-up spot just 2 points ahead of Adamstown in 3rd. Adamstown’s three scorers, in 5th, 6th and 12th places, were Gráinne, Niamh and Isobel English. The Boys U14 race was dominated from the start by Myles Hewlett of United Striders. Myles had a fabulous Summer season with All-Ireland Gold in 1500m and Silver in 800m, and PBs in both, one of them a CBP. Although unchallenged in this race he showed why he is top of his game with an exhibition performance that combined ergonomic efficiency with speed endurance. Myles’ closest pursuer from early on was brother Cosmo. Content to run at a more conservative pace he had sufficient in the tank to stay in the Silver medal position ahead of fast-finishing clubmate Eoin Shannon. Indeed Striders filled 9 of the top 10 positions with DMP’s James Hegarty, in 5th place, spoiling their efforts at a clean sweep. Not surprisingly, Striders A, B and C teams took all three sets of medals on 6, 7 and 27 points respectively. The audience was treated to a tour de force performance in the Girls U16 race which matched that of the previous race. Claragh Keane of DMP put down an early season marker that she is back to her best as she galloped away from the field. Her easy yet fast-moving stride hides a lethal and punishing fire-power. The Menapians duo of Eimear Halpin and Ciara Dolan were happy to battle it out for the minor placings with Eimear ultimately easing away to take the Silver and Ciara settling for the Bronze. Aoibhinn Crean of Adamstown placed 4th. The Boys U16 race was, from early on, a two horse race between new United Striders member Ben Wall and Joe Byrne of SBR. It was nip and tuck up to the final few hundred metres when Ben put the head down, bolted for the line to claim the county title. Joe, graceful as always whether winning or not, had to settle for the Silver. Adam O’Connor (United Striders) was 3rd while Ronan Griffin (DMP) placed 4th. Striders took the team title (9 points) with Robert Wall, in 5th, the 3rd scorer. Kilmore took the runner up spot on 30 points. The Ladies Novice and U18 races were run off together. U18 athlete Mairead Crean of Adamstown AC, running on home turf, took it out from the start and, by the end of the first lap, had opened up a small lead. Novice runners Beth O’Connor and Sandra Young (both United Striders) plus Angie Redmond and Esther O’Leary (both Slaney Olympic) traded places as they worked to stay in touch. 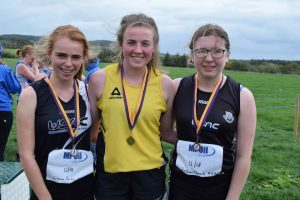 Mairead went on to stretch her lead over the three laps and take the U18 title while Angie Redmond broke away from the pursuing group to take the Novice title ahead of Beth O’Connor in 2nd and Esther O’Leary in 3rd. The Striders duo of Rebecca Bawden and Gráinne Flannelly were 2nd and 3rd, in that order, in the U18 race. The Novice team title went to United Striders (23 points) just ahead of Slaney Olympic in 2nd (26 pts) with SBR in 3rd (37 pts). The Boys U18 race was won in some style by Conor Keane (DMP). Conor, looking fit and totally untroubled, built up an unassailable lead over the chasing Striders duo of Aaron Browne and Cian Flanagan. Aaron pulled away from his clubmate in the final stages to take Silver leaving Cian in the Bronze medal position. Striders took the team title (10 points). A big field toed the line in the final race of the day, the Novice Men’s 6k. By the end of lap 1 of the 1km loop, and running into an ever-strengthening head-wind, a small lead group opened up a margin on the well spread-out field. As the race progressed this group, consisting of the DMP trio of junior athlete Liam Turner, Paul Flanagan and John Stone, along with George Delaney of United Striders, continued to build on their advantage. Into the final lap and Liam Turner dropped off the pace. Just before the bend for home Flanagan seized the initiative and went on to the take the title with Stone 4 seconds back in 2nd and Delaney in 3rd. DMP’s massive strength in depth (6 in top 12) meant they were a shoe-in for the Gold on 14 points with Liam Turner in 4th and Liam Collins in 7th completing the scoring quartet. George Delaney led Striders to team Silver (49 pts) while SBR were 3rd (53 pts). Tagged Wexford Juvenile Cross Country Championships 2018, Wexford Novice Cross County Championships 2018. Bookmark the permalink.